One of the attractions of scientific research into dowsing is that the individual can go back to the days of amateur science without the need for large teams, vast budgets, or multinational co-operation. It is an ideal study for individuals to undertake on a part-time basis, with no need for a well-equipped laboratory. The time also currently seems right for studying dowsing scientifically, as the fascinating and inexplicable aspects of dowsing are no more unbelievable and they have similar concepts to other current research topics in mainstream physics, including the science of consciousness (Do we see something because it is there or does something exist because we sense it? ), the “weird” effects of quantum theory, multiple universes, ten-dimensional universes, quintessence and dark energy, and dark matter. To make progress in understanding dowsing, it is necessary to adopt scientific principles which include the use of mathematics, as the universe, in general, has been best understood and defined by numbers. This, in turn, means that scientific progress needs to be made by undertaking laborious, meticulous, repetitive measurements. Indeed, it was this approach which led to the understanding of astronomy. There are many challenges in measuring dowsing. At present, the concepts are intangible where, literally, detection of dowsing is “in the mind” of the person making the measurements, with the use of L-shaped rods, pendulums and “Y”-shaped hand-held implements amplifying what the dowser has detected. The author is not aware of any universal instruments that can, independently of human involvement, detect all types of dowsable energy fields, nor are there absolute measurement scales for such concepts as field strengths, that are totally independent of the human mind. The measurements that follow are to a sufficient accuracy to illustrate the principles involved. It is left to other researchers to refine techniques and to undertake the measurements to a higher degree of accuracy with larger samples. Where appropriate, suggestions are made as to areas for future research. This article illustrates some of the benefits of using scientific principles including measurement, and in particular the measurement of Range. The easiest and most accurate measurement in dowsing is a positive “Yes” signal, when a dowsable energy field is detected. This fact forms the basis for most of the measurements in this article, and leads to one of the most useful measurements that can be made, which is to answer the question “What is the furthest distance from an object that a person can detect the dowsable energy that is being emitted by the object?” This shall be defined as the Range (r) and for the remainder of this article is measured in mm. Measurement of the dimensions of a dowsable energy field include: length, width, height above the earth’s surface, and depth below the earth’s surface. For non-linear fields, diameters or radii of curvature can be measured. There are numerous examples and applications in using scientific measurements to quantify dowsing energy. One example is given below and relates to the determination of the part of the human body that detects dowsable energy. What part of the human body detects dowsable energy? This simple experiment, which requires no complex, expensive, or electronic equipment, and just involves adjusting the height of a dowsable object, can indicate the part of the human anatomy that detects dowsing. As always in science, it is satisfying to start with some theory, and then demonstrate its truth by experiment. For the purpose of determining what part(s) of the human anatomy is responsible for dowsing, two extreme cases are considered. If any part of the human body has equal sensitivity to detecting dowsing energy, then Figure 1 illustrates graphically a person walking along the x-axis, towards the y-axis which represents the height of a small source of dowsing energy, such as a small crystal, stone, wood, etc. As will become apparent, a point-emitting source is essential for this experiment, in order that the geometry is theoretically correct. 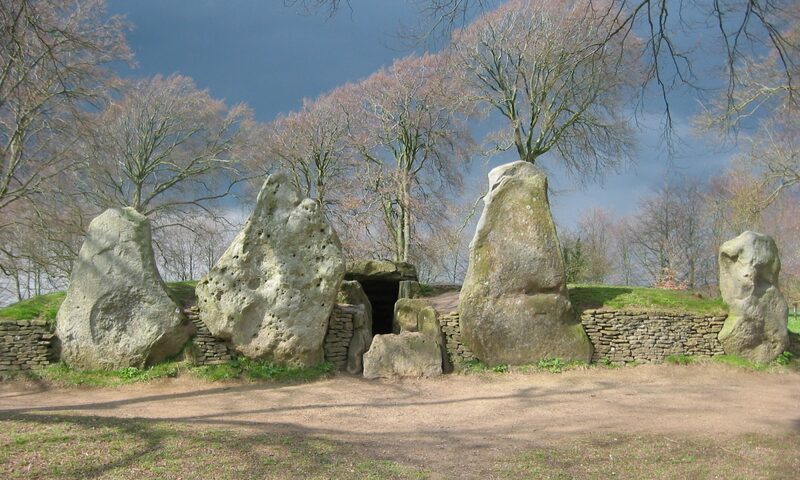 The theory of this experiment is invalidated if the experiment is attempted with a large source object or megalith – assuming their heights can be adjusted! In Figure 1 the y-axis is re-labelled as height, where the height of the dowsing source which is adjusted above the ground is h mm. The x-axis represents the floor along which the dowser is walking when approaching the dowsing source. This axis is re-labelled as the Range, r mm, and is the distance the dowser is away from the source object. ra is the furthest point at which a person can detect the dowsing energy emitted by the small source. For each source this is a fixed distance representing the extent of its dowsing energy field. If the postulation was true that all parts of the human anatomy were equally sensitive to dowsing, then whatever height, h mm, the source is placed above the ground, the person approaching the source will always detect it at r = ra. If the height of the person is H mm, the vertical straight line AB in Figure 1 extends to H mm. As the source is raised higher than H, in this postulated model, it is assumed that the top of the head will be the part of the anatomy first detecting the dowsing energy emitted by the source object, and hence the relationship between h and r will form a curve BC in figure 1, i.e. the person will have to approach the source closer to first detect its dowsing energy as it is moved further and higher away from him. For example, if the source is placed at height S the dowser will have to stand on the line DE before he detects the dowsing energy from the source. Once again, a parabolic type of curve is obtained which is symmetrical about the dowsing point, X. If postulate 1 above is correct, the graph of the experimental results of the h-r relationship should look like Figure 3 (where the Range of a source is 1,100mm, and the height of the person is 1,840mm). If postulate 2 above is correct, the h-r relationship should look like Figure 4 (where the dowsing detector is 1,735mm from the ground, and the Range for the source is 1,100mm). Figure 5 illustrates an actual experiment where a dowsable object source (in this example a rose quartz crystal) is suspended at various heights, as depicted on the h-axis, whereas the r-axis depicts the furthest the dowser can detect dowsable energy from the source (measured from a consistent part of the body such as the leading edge of a foot on the floor). It is assumed that the height of the source object that corresponds to the greatest Range of detecting dowsable energy equals the height of the part of the anatomy which detects dowsing. It is seen from this example that the optimum height of the source is 1735 mm, which corresponds to the forehead part of the brain of the person undertaking the measurements. The secondary peak interestingly occurs at the height of the person’s heart. In this experiment, when asking for a dowsing response no assumptions were made of the location in the body of the “dowsing detector”. A corollary experiment in which the source is approached both backwards and forwards can indicate the location of the part of the brain involved in dowsing. In the above example, the back of the brain rather than the forehead seemed to be the dowsing detector. So how does theory compare to an actual experiment? Figure 6 superimposes postulate 2 (Figure 4) on the actual experiment (Figure 5). Postulate 1, in which the whole body detects dowsing is definitely false. In general, a close fit occurs to postulate 2, where the brain is the prime detector but with some interesting perturbations and deviations that deserve comment. Although the perturbations near the peak of the theoretical parabolic curve suggest there may be more than one dowsing detector in the human anatomy, more probably the energy being detected by the brain comprises not only the energy from the crystal source, but is also augmented by the dowser’s own bionic energy. This may originate from his other chakras (in particular the heart, forehead and crown chakras) plus the local background dowsing energy interacting with the dowser and the source object. In addition, the deviations from the theoretical single point model would be caused by not asking the correct, or optimum, dowsing question, as well as a zero calibration error caused by the imprecise method used in measuring the Range. The latter involved using a tape measure lying on the floor and, say, using the leading edge of the right foot as the reference point. There is an obvious discrepancy between the distance from the back of the brain (if that is the detector) to the tip of the large toe! The corollary to the above discussions leads tentatively to the following Law for correcting the apparent range (r) of a dowsing source as detected by a dowser to the actual range of a small source object (ra). i.e. the true Range of an object’s dowsable energy field equals the square root of the sum of the square of the Apparent measured Range, plus the square of the difference in height between the dowser’s brain and the height of the small source. Obviously this does not apply to dowsing large megaliths greater than the height of the dowser. In summary, the above is a simple, low-tech method for determining what part of a person’s anatomy is responsible for the phenomenon of dowsing, and suggests that it is at the back of the brain. Future suggested areas of research should repeat this experiment, using more precise dowsing questions, and with a large sample of different people to investigate if the general pattern of Figure 5 is similar for all people, or whether different people have different dowsing detectors in their bodies. In parallel with this physical study, biological studies should be advanced of brain waves when dowsing. In particular to locate with more accuracy the specific areas of the brain responsible for dowsing, and if it is the same part of the brain used whilst meditating or whilst using visualisation. Similarly, there is much anecdotal talk about the influences of the right and left side of the brain whilst dowsing, and it would be beneficial to quantify this. Current work suggests that the pineal gland in the brain is involved in dowsing, possibly together with the thalamus. Dowsable energy received from an emitting source that the observer can read passively and measure. Examples of this would be picking up dowsable energy (or auras) from rocks, crystals, water, plants, people, etc. Dowsable energy that is created and transmitted by the observer (via the brain). Examples of this would be creating local or remote dowsable energy lines, and energy fields, possibly hundreds or thousands of miles away. interacting with the emitting source. Examples of this would be using dowsing for healing where the dowsing energy characteristics of the “patient” are altered, or for modifying, moving and deleting dowsable energy fields, or for using dowsing techniques for answering questions. The question to answer is “is the same part of the brain responsible for all the above forms of dowsing?”. Any person, group, or academic body interested in taking any of the above concepts further, wishing to undertake their own associated research work, or just requiring more information, should contact the author by e-mail at jeffrey@jkeen.fsbusiness.co.uk. The author would be willing to co-ordinate this work with others in a structured and more productive method of working. All rights reserved. No part of this article may be reproduced, stored in a retrieval system, or transmitted or translated in machine language in any form or by any means, electronic, mechanical, photocopying, recording or otherwise, without the prior written permission of the author.